Kids are already back to school but still we need to spend time shopping for more school supply. 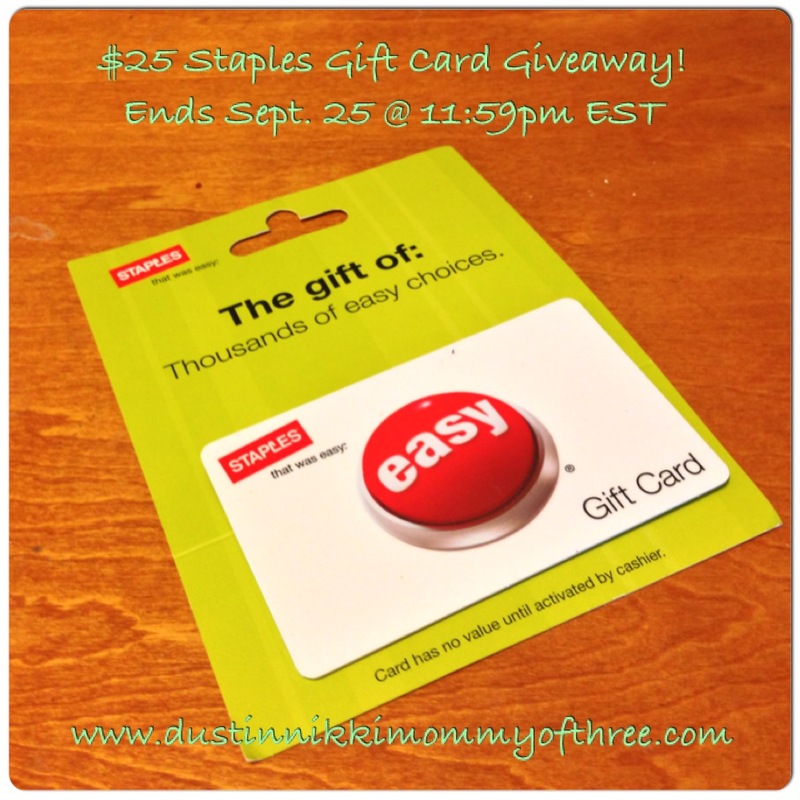 And we are happy to offer our readers $25 Staples Gift Card Giveaway hosted By DustinNikki Mommy of Three and sponsored by Staples. Did you know that Staples have expanded their assortment of educational supplies? They have! At select Staples stores, you can find their "Crayon Wall" where you can pick up an empty tin and select your favorite Crayola crayons and completely customize the colors in your tin. Other expanded supplies also include other Crayola products such as Dry-Erase Pencils, Model Magic and Air Brush Sprayer. You can also find Leapfrog products such as the Leap Explorer and Leap Tag System. from Melissa & Doug there are wooden puzzles, car carrier and scratch art and from Alex Toys you can find Make and Tape! See DustinNikki Mommy of Three's shopping experience and review ----> Here. See what she thought about Crayola Model Magic and Dry-Erase Pencils! Disclosure: Teddy Out-Ready is not responsible for prize fulfillment. DustinNikki Mommy of Three received a product for free in exchange for her honest review. DustinNikki Mommy of Three will be responsible for contacting winner(s) of this giveaway. If you have any questions, please direct them to Nicole from DNMOT blog. I was not compensated for this post. This giveaway is no way sponsored, endorsed or administered by, or associated with Facebook, Twitter, or Pinterest. I would get my kids new Crayola supplies and paper. I would stock up on mailing supplies - envelopes and packaging supplies. If I won I'd get some office supplies such as paper, pens, pads etc. i want a samsung chrome book so bad, and plan on buying it from staples.com, so this will go towards that! thank you! I would use it for more ink for my Canon printer like the Canon CLI-8 Color C/M/Y Ink Cartridges (0621B016), 3/Pack. Printer paper and toner are two possibilities for this GC. Maybe some recycled paper notebooks! I would give the GC to my son who teaches middle school special needs kids. He could buy classroom spplies with it. I would end up putting it towards some homeschool books. They have an amazing set of preschool activity books. I would put it toward a new paper shredder. Ours bit the dust earlier this year. The diamond textured coupon file, paper clips and copy paper. I would buy ink -always running out! Binders, craft supplies & toner! I need printer ink to print coupons! I would buy Crayola supplies! Lexmark Laser Printers E210 Cartridges. I would love to buy my niece some new art supplies. I would put it towards a Kindle that I have been saving to buy. I would buy printing paper and pens. I would buy ink cartridges fr my printer. Home work has to be typed this year. I would buy one of their new calendars. They look so cool and I need one! I would buy basic supplies for my students who don't have any. I'd put it towards a Brother MFC-J470dw Color Inkjet All-in-One Printer as my printer has died. Thanks for the giveaway. Email subscribe with vixandI at gmail dot com. I would buy my highschool son a flash drive or a memory card. Like to get a new office chair. I would put it towards a photo printer! I would get the Omnitech 10 Sheet Cross-Cut Shredder, I'm in need of a new shredder! I actually wouldn't get anything for myself, I'd use give it as a gift to my sister who is a new teacher! Quartet® 11" x 17" Dry Erase Board Black Frame I need one badly. I would buy printer ink & paper, sheet protectors and binders. I would buy some college supplies! I would buy printer ink for sure. Oh I would love to buy the Epson® Expression® Home XP-400 All-in-One Printer! Ink for the printer. It always seems to be running low! I need a new power adapter for my Mac laptop and Staples carries them, so I would use the GC on that. Thanks for the chance! I would buy colored paper and card stock. I definitely need to get my daughter markers, crayons, and glue. I would buy paper, envelopes, pens, and post-it notes. Ink for the printer, I always seem to run out at the worst possible moment. I would save it for next school year and use it towards my sons school supplies! I would use it towards ink for my HP printer! Never can have enough :) Thanks for the chance!